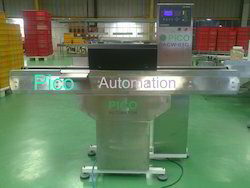 We at PICO automation, 100% Design and Manufacture varieties of Checkweighers purely based on customer requirements. 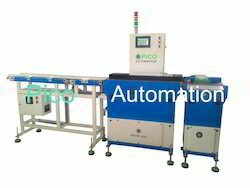 PACW 05G is specially designed High-speed Check weigher to handle cylindrical products in the form of PET/Glass containers and etc.These systems can handle product diameter from 30mm. Power requirements: 1phase, 220V, 50Hz. MOC: Mild Steel / Stain less steel. The above-given details are subject to change without any prior intimations. PACW 1/2/3/4G is more suitable for weighing compact products packed in cartons, PET/Glass containers, pouches, bags and etc. The above given details are subject to change without any prior intimations. 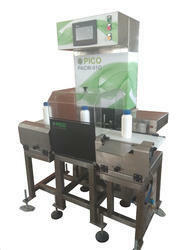 At PICO we have developed our new model Checkweighers with upgraded features. Kindly contact us to know the product in detail. This is a tailor-made Weighing Automation with collection/discharge chute unit, used for Carton filling in Food Industries. This system has Automatic/Manual mode options included with Foot switch control. 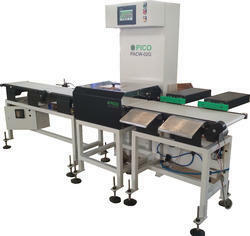 We at PICO manufacture customer made In Line Weight Checker. Owing to our state-of-art manufacturing unit and the usage of leading-edge technology, we are able to present a comprehensive range of Checkweigher. Owing to features like dimensional accuracy, durability and easy to use, the offered weighers are extensively demanded in the market. A team of deft professionals with hard-earned experience manufacture the offered range using quality assured raw material and the latest technology. 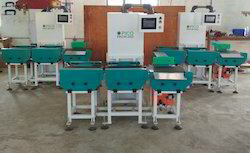 Our respected clients can get these weighers from us at market leading prices. Backed by skilled and creative professionals, we offer a superior range of Check Weigher for Master Cartons. Our team of experts develops these products by consuming first-rate components with the help of newest machines. Additionally, with the support of our developing unit that is abreast with all the newest technologies, we properly develop these products according to the industry standards. Besides, these products are extremely applauded for its best quality. The system shown in the Image is a In-line Checkweigher with double rejection i.e seperate product rejection for PLUS and MINUS value products. 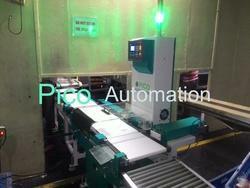 Checkweigher shown in the Image is been supplied for a Pesticide manufacturing Industry. The system is made of SS304 construction which gives output of 50PPM with +/- 0.2% Grams tolerance. 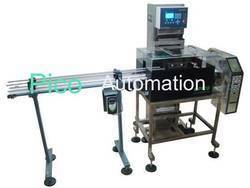 We manufacture and supply Check weighers as per requirements.